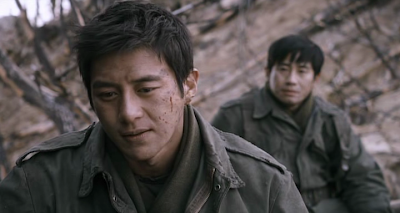 Before getting into a discussion about Jang Hoon’s much-ballyhooed new feature The Front Line, I feel that I should mention that over the years I have had a troubled relationship with war films. I have seen all kinds, from different eras, different countries, detailing different fights, and espousing all sorts of different points of view. On a cold Sunday afternoon, there isn’t a whole lot that can beat a repeat viewing of seminal classics like David Lean’s The Bridge on the River Kwai (1956), John Sturges’ The Great Escape (1963), or Billy Wilder’s Stalag 17 (1953). Those are actually all POW (Prisoner of War) films but there is a great wealth of others that I can always return to, including: Masaki Kobayashi’s The Human Condition trilogy (1959-1961), Kon Ichikawa’s The Burmese Harp (1956) and Fires on the Plain (1959), Francis Ford Coppola’s Apocalypse Now (1979) or HBO’s 10-part mini-series Band of Brothers (2001). When the elements fall into place, a good war film is one of the most engaging types of entertainment across any medium but that correct balance is a difficult thing to achieve. 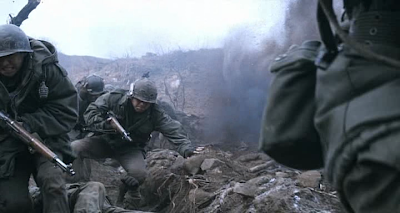 War films differ from other genres as they are naturally rooted in spectacle, feature little to no romance or indeed female protagonists, and must frequently sacrifice characters on the battlefield. What’s more, rather than following a personal trajectory, the main thrust of the narrative is often consumed by a story far greater than the leads that we are to bond with on screen. More and more I find myself apprehensive when I hear about a new war film since I don’t think they make them as well as they used to. 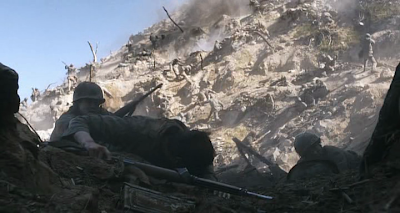 Regarding past conflicts like WWII and Vietnam, it feels like most of the great films have already been made. The immediacy has past and while revisionism and objectivism can motivate new and interesting views on these military operations, for the most part, the ‘epic’ feel of these past films is a rare achievement in today’s cinematic landscape. Before watching The Front Line, my expectations were mixed. On the one hand it is Jang Hoon’s third film and his previous two, Secret Reunion (2010) and especially Rough Cut (2008), have been great films. On the other, it is a war film and, as I have outlined, my relationship with these is problematic. More troubling still was the mixed reaction it received from many critics and cinephiles whose opinion I trust, although it also received significant industry recognition, including Best Film accolades at the Daejong Film Awards and the Critics’ Choice Awards, which somewhat offset my reservations. In 1953 during the Korean war, lengthy negotiations are underway for a ceasefire, while the fight rages on for the Aerok Hill, the possession of which switches endlessly between the North and the South. After a company commander of the South Korea army is found dead as a result of friendly fire, Kang Eun-pyo (Shin Ha-kyun) is sent to the front line to investigate. 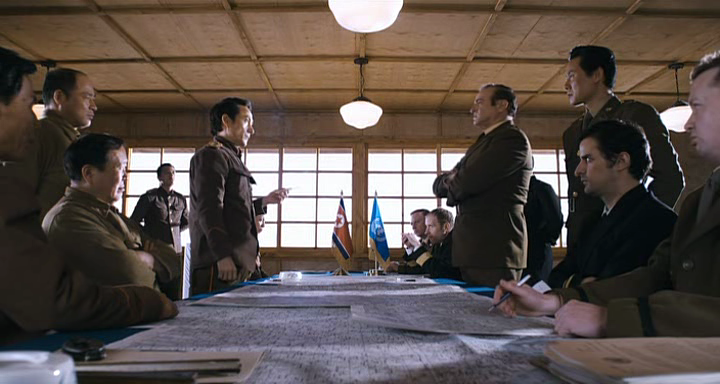 He meets a friend there, Kim Soo-hyeok (Ko Soo), who he assumed had died but has in fact turned into a seasoned soldier. The whole company is battle-hardened and due to significant casualties the officers are youths who have long since lost their innocence. Alligator company continues to wage war for a small hill as the peace talks drag on, with no end in sight. Park Sang-yeon’s script is grandiloquent in its exploration of this theme, brimming with pithy aphorisms such as “The whole world is telling us to fight, but this fog is telling us not to” and “Do you know why you're losing? Because you don't know why you're fighting”. We are so accustomed to anti-war messages that when heavy-handed interjections such as these come along they tend to come off as trite. War films are a worthwhile form of entertainment but they need to have more to express than this oft-mined topic. The problem is that The Front Line feels like a chamber piece where this one motif reverberates off of everything, drubbing you with its ethical superiority. Furthermore, the single location used for the bulk of the film, despite numerous styles and visual tricks used to render it more interesting, reinforce this feeling of it being a chamber piece. The film feels small, though perhaps deliberatly so as Jang aims for a claustrophobic atmosphere in the battlefield and frequently breaks rules of spacial mapping which serve to disorient us. Despite this, the battles scenes are often impressive, a number of great tracking shots and large, magnificent canvasses are extremely effective. The Front Line is well made and features some stunning production design as well as some strong cinematography, I particularly liked the heavy Dutch tilts of some of the shots. By and large though, it feels like a missed opportunity. Jang exhibits a sure hand as a filmmaker but his big style can't overcome a disappointing script, especially as it segues into a mawkish and protracted finale after giving us a false climax. The film is well worth a watch though, for some strong performances, especially from Shin Ha-kyun and Lee Je-hoon, and some very convincing set pieces. The Cine-Asia release of The Front Line is out on DVD/Blu-ray February 27 in the UK.